High Dale Park Barn Self-cateringHigh Dale Park Barn is situated in an extremely peaceful location, well within the Lake District National Park, at the head of the tiny, unspoilt valley of Dale Park. (Latitude 54.330491, Longitude -2.995523). Dale Park is one of Lakeland's best kept secrets....very quiet & peaceful. 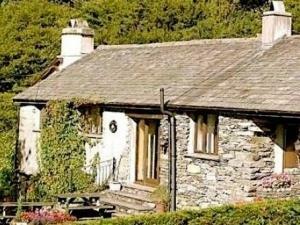 The property is situated in an extremely peaceful location, well within the Lake District National Park, at the head of the tiny, unspoilt valley of Dale Park. Dale Park is one of Lakeland's best kept secrets. It abounds in wild life. Trout fishing and pony trekking nearby. Immediate access to forest walks, forest sculptures. Children welcome from any age. High Dale Park Barn offers weekly bookings starting on Sunday and sometimes short breaks. Best to ask for our 'How to Find Us' sketch map! High Dale Park Barn is approximately 40 minutes by car from Jct 36 of M6. At Jct 36 follow A590 to Newby Bridge, approximately 15 miles from M6. Continue straight over the large roundabout then take the next right, signposted Lakeside. Cross over the narrow bridge and follow signs towards Hawkshead, passing the Lakeside Hotel. After approximately 4 miles pass Esthwaite Trout Fishery on the right. After 0.25 miles turn left up steep hill signposted Ulverston and Dale Park. The property is 1 mile further.